Are You a Smart Online Shopper? Wish list? Check. Credit card? Check. Okay, before you head off to your favorite online store, are you sure you’ve found the best possible price for the item you’re planning to buy? Have you researched other brands or similar items? Have you searched for coupons or other discount offers? Are you getting free shipping whenever possible? And are you taking advantage of the power of group buying, and the wisdom of the crowd? TIP #1: Look for rebates and rewards BEFORE you shop. Loyalty programs such as Ebates offer shoppers rebates and other incentives to purchase from stores where they already shop. Ebates offers up to 25% in cash rebates when you shop online at popular stores like Amazon, Best Buy, JCPenney, Kohls, Macy's, Old Navy, Target and 1000 more. Even better, Ebates will pay you $100 when you refer 3 friends via their Tell-A-Friend promotion. PLUS... you'll get a $10 Gift Card when you open a new Ebates account and spend $25 or more at your favorite store. It's a win-win-win-win... Ebates is free to join. You get paid to refer friends. You get a $10 gift card. And you get paid to shop! TIP #2: Use price-comparison sites to find the best deals. Google Shopping is a good place to start. Just type in what you’re seeking, such as "42 inch HDTV" or "cordless drills" and up pops an assortment of vendors. The initial results are displayed sorted by "relevancy" but I recommend that you re-sort them by price from low to high. Bizrate.com is another good tool. It can display prices including shipping to your Zip code, or even limit your search to items that ship for free. Pricegrabber.com lets you save interesting items as you shop for comparison to others. Pricewatch.com was one of the first price comparison sites, specializing in computers and electronics since 1995. They now list non-tech items as well. TIP #3: Before you buy, look for coupons that can reduce your final price. RetailMeNot has thousands of digital coupons and discount codes from many well-known and obscure online sellers. A little known trick is to use Google’s search function to find coupon codes buried on blog pages. Just use "coupon" and the name of the brand, merchant, or product that you are seeking as your search term. TIP #4: An Amazon Prime membership may save you money. If you use Amazon.com frequently, that $99 flat fee gets you unlimited free, 2-day shipping on products delivered by Amazon. If you haven’t been to Amazon lately, it’s no longer just a bookstore. Amazon also offers music, movies, electronics, home & garden, health & beauty, toys, clothing shoes & jewelry, sporting and outdoor goods -- just to name a few categories. Also, take note of the prices offered by Amazon affiliates on both new and used items; they are sometimes lower than Amazon’s price. Amazon is also a great shopping research tool. After searching for the item (or type of item) you’re after, Amazon will help you compare brands, prices, and retailers. You can also see what items and accessories other customers bought. TIP #5: Don’t forget eBay, especially if the item you seek is a staple rather than a fad of the moment. Because it's an auction site, the price you pay items (both new and used) tend to be very reasonable. And if you prefer to skip the drama of a bidding war, look for an item with a "Buy it Now" option. Oh, and here are two eBay Ninja trick that’ll save you money every time. First, start your search at the eBay home page. When you get the list of matching items, refine your search by checking the "Completed listings" box under the "Show Only" header This will tell you what the item has actually sold for in recent eBay sales or auctions. And second, use BidRobot to boost your chances of winning the auction. TIP #6: Take advantage of group buying power. 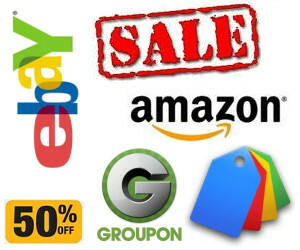 Group-buying services such as Groupon, LivingSocial are geared mainly towards local, face-to-face merchants. But Groupon has inspired a slew of "daily deal" offers from many online sellers, too. Subscribe to email lists to receive special limited time offers from your favorite stores. TIP #7: Use social networking to your advantage. Many online sellers want you to follow, friend or "like" them on Twitter and Facebook. If you do, you’ll soon be bombarded with coupon codes and special offers. The good news is that you can unfollow or unfriend to stop the flow after you’ve made your purchase. TIP #8: Got gift cards? Gift cards are a great option when you don't know exactly what to get for someone on your Christmas list. My friend Aaron and his team have created GiftCard Zen, a site where you can buy gift cards at a discount. Some examples on the site today are Coldwater Creek (28% discount), TJ Maxx (19.5%), and Macy's (11.4% discount). You can also sell your unwanted gift cards for cash, or check the balance of a gift card you have. GiftCard Zen handles gift cards from hundreds of stores. It's a win-win scenario! TIP #9: Skip the Warranty Are you giving a mobile phone, tablet, computer or TV? Read SCAM ALERT: Mobile Device Insurance and Extended Warranties to find out why these are almost always a waste of money. TIP #10: Avoid Penny Auctions Have you seen those commercials where people brag about how they bought a $1200 HDTV for $25? See my article Penny Auctions: Scam or Legit? to see why these sites are to be avoided. BONUS TIP: The Wisdom of Others It's smart to take advantage of the experience of others, especially when it comes to considering big-ticket purchases. Sites like Amazon and Epinions offer actual consumer experiences and reviews of products. Consumer Reports and PC Magazine are good places to look for professional ratings and reviews. Most recent comments on "10 Tips for Online Holiday Shoppers"
Thanks for the above info. I had not heard of some of your suggestions. Bob Rankin always delivers more than promised. Brand-new and long-time Rankin File members learn this early on. A prime example is that Bob just saved me a bundle while expediting completion of my Christmas Shopping List with just this article. Love ya Bob. Merry Christmas and a Happy All Year for 2016 and beyond!!! Your #1 listed option (and some others) makes me a little uncomfortable. When signing up for such sites you might get a deal but then you have to put up with the bombardment of emails and trivial email afterwards. I would suggest creating an email just for such sites so your regular one doesn't get polluted with possible junk. A. Use a free browser add-on called "Blur" to mask your email address (https://dnt.abine.com) for any websites that you possibly don't trust. Blur makes it easy to block junk email from anyplace. B. For #7 (using social networking): I found that setting up a dummy account at Facebook, for example, and not ever entering any information in this dummy account means that you won't be bombarded with emails when you use your dummy account for signing up. They also then can't see your "Friends" or your age or where you live, etc..
Bob, I noticed about Amazon that they carried the brand of flea and tick prevention application that I had been buying from the pet care pet RX sites, at about 30% less. Since the type I use is EPA classified as a "general use pesticide," the veterinarian (who does not carry that brand of preventative application) does not even have to approve it. Bob - I tried the link for Google Blogsearch and found that it just went to regular old Google. Some more research indicates that Google discontinued Blogsearch in May 2011. Did you meant to link to another blog search engine? EDITOR'S NOTE: Sorry, the link was wrong. Fixed now! Great article, Bob...as always! Thanks and happy shopping to you too. My tip, for your Canadian readers, is this: if you are collecting Airmiles or Aeroplan miles don't forget to shop via the Airmiles or Aeroplan miles e-stores. Sign in there first, and then go to whichever online merchants you want to buy from who are Airmiles or Aeroplan miles partners. In many cases you will earn not only the regular number of miles but also bonus miles. Not sure if this also works for U.S. readers, but if so, it's a great and painless way to top up your travel rewards account. Got me a free return Toronto/Miami flight last year AND the year before. Another excellent and timely article by Bob Rankin. Bob, I have been spreading the word about you. Just my way of thanking you for everything you do. For automatic, realtime price and coupon checking right in your browser I would recommend the PriceBlink extension/add-on. It opens an otherwise-hidden bar at the top of your browser window when you are on an item's page. I have been using it for years and it has saved me hundreds of dollars.